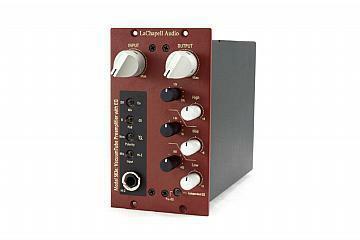 The LaChapell 583E single channel, double space 500 series microphone tube preamp incorporates one 12AX7/ECC83 vacuum tube, Jensen JT-115K input transformer, and EQ stage with transformerless output. The Model 583E featuring the same amplifier stage found on the 583S including the Jensen JT-115k input transformer coupled with an ultra-clean transformer-less three-band EQ section with fully sweeping frequency controls and cut/boost settings of +/- 8dB. The EQ can run as an integrated EQ serving the preamplifier or separate as its own autonomous module where both units run independently.